The boys had an amazing time at the Take Part 2019 Event in Venue Cymru, Llandudno. This year was even more spectacular than usual I think, as it was the 10th one. The tickets were very reasonable. What I hadn’t realised was that I didn’t need to buy tickets for my husband and myself when it was the smaller workshops. Although it did mean we had an excuse to join in! So, I guess it was worth the extra spends. We listened to an incredible presentation called Mind Blowing Numbers. The speaker has written the hugely popular Murderous Maths children’s series of books. He was very engaging, an hour about maths wasn’t dry or boring! Complicated perhaps, but my two seemed to stay interested the whole way through. I wish we had booked his Murderous Maths Magic show too, but it clashed with something else we wanted to do. My boys liked getting up to help with one of his demonstrations. This was a real treat we listened to a presentation by the famous author and illustrator tag team! We learnt how to draw pugs like the ones from the Pugs from the Frozen North book. My two already had the book so were very excited to see the author and illustrator up close. Afterwards the audience helped them both complete a board game – it was great hearing everyone’s imagination coming to life with such flamboyant and brilliant suggestions being shouted out. We queued for a book signing afterwards. I think the boys will both treasure their books even more now! I am quite keen to order the Mortal Engines books and give them a try! 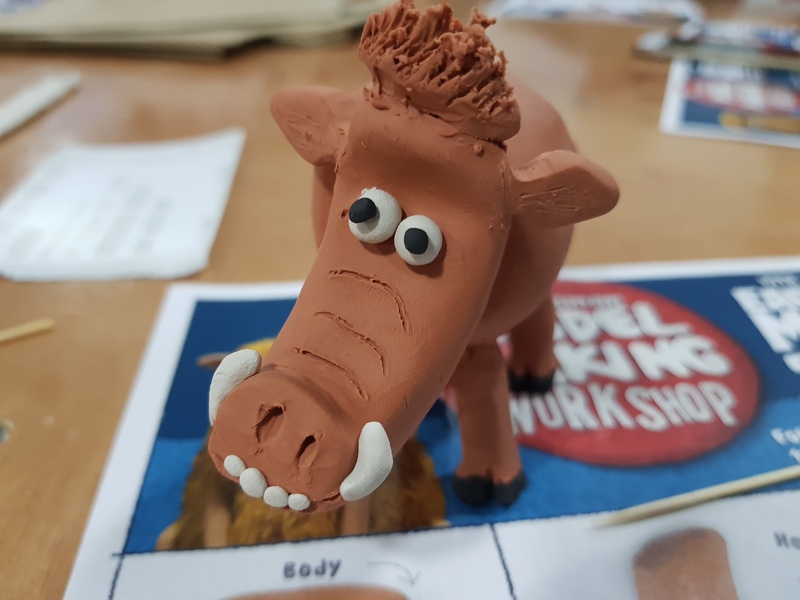 I really enjoyed this we all had a chance to create our own Hognob from the Early Man film. The senior model maker Jim Parkyn kept everyone’s interest and gave us lots of tips to make sure our creations turned out well! What I liked best was that each one has its own personality. No two hognob characters were the same! We really laughed together during this workshop, my eldest made these hilarious super model legs for his hognob! Afterwards you could take your creations home, ours are proudly on display! The boys and I had a blast getting involved in the drumming workshop. We soon managed to learn the Brazilian Carnival rhythms and really got into it. I even started whirling the drum sticks above my head between goes at drumming! We managed to catch one of Spark’s performances too and they are incredible. As samba bands go they are definitely my favourite! They put so much energy into their performances, plus I love the costumes, face makeup and glowing drums! We had a gore makeup session with Zoe Ellen. We learnt how to make a realistic looking bullet and knife wound. My youngest is quite theatrical so he pulled the prefect face for it! Everything was provided including plenty of wet wipes if you wanted to clean up afterwards. But lots of people spent the day covered in injuries! I will do a separate post about this I think as I am tempted to order the wax and try again at home. We really enjoyed the experience although it can get a little messy with the fake blood! Zoe Ellen had plenty of time for everyone making sure they knew what they were doing. As I have two boys, I didn’t book the glam workshop. However I was tempted to go just myself when I saw everyone later with sparkling festival ready faces! I really can’t wait to see what is in store for Take Part 2020.